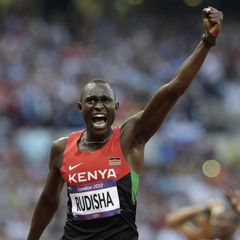 London - David Rudisha of Kenya won the men's 800m Olympic title on Thursday in a stunning new world record of 1min 40.91sec. The 23-year-old world champion took control of the race from an early stage and tore away at the bell, charging down the home straight five metres clear of Nijel Amos of Botswana as the crowd rose to its feet. Rudisha smashed his own world record of 1:41.01 set two years ago, while Amos timed 1:41.73, and another Kenyan, Timothy Kitum, took the bronze in 1:42.53. Every athlete in this remarkable race ran either a personal best or a season's best time.